In memory of our glorious dead. Remember the men and women of the London Midland and Scottish Railway. In grateful memory of 3719 men of the London and North Western Railway company who for their country, justice and freedom served and died in the Great War. 1914 - 1919. 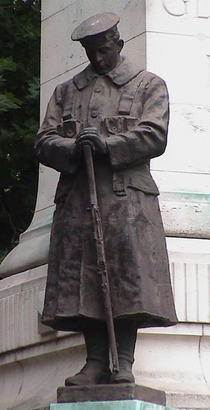 This monument was raised by their comrades and the company as a lasting memorial to their devotion. This memorial forms the roundabout in the bus station in front of Euston Station. The lettering is, unusually, made up of dots, pierced in the stone.